Most pre-war Japanese animation is derived from Japanese fairy tales and mythologies. 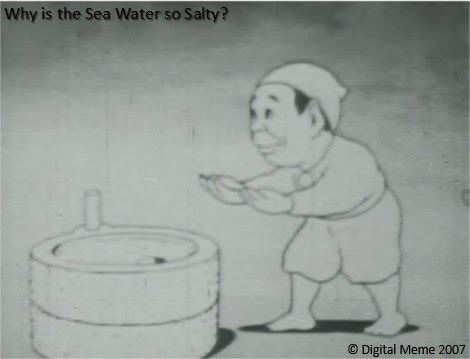 However, the origins of the story behind Yasuji Murata’s animated folktale adaptation Why is the Sea Water Salty? (海の水はなぜからい / Umi no Mizu wa Naze Karai, 1935) are very complicated. Long before science could explain why oceans are salty, myths and legends were developed to fill the knowledge gap. Murata’s film seems to have been influenced by a tangled web of European and Japanese folktales. This retelling by one of the great pioneers of anime appears on Disc 3 of Digital Meme’s Japanese Anime Classic Collection 4 DVD Box Set . The film has not been digitally remastered and shows the wear and tear of time: flecks, scratches, and even small tears. It begins in the typical manner of a Japanese folk tale with “Mukashi mukashi. . .” (Once upon a time. . .). As Why is the Sea Water Salty? 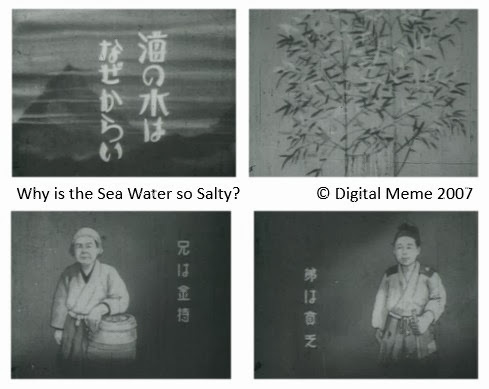 is a silent film, the text appears on title cards and the Digital Meme features the added bonus of narration by benshi Midori Sawato and soft background music. Two brothers, one rich and one poor, are introduced on title cards. New Year’s is approaching and the younger brother is lacking supplies. He goes to ask his older brother for help. He finds him pounding mochi (glutinous rice). The older brother looks down on the younger one and dismisses his request saying that his younger brother is undeserving of his rice cakes. Disappointed, the younger brother heads home with his head hanging low. Along the way, he encounters an elderly man who almost falls off a footbridge. He rescues the man and to thank him for his kindness, the elderly man gives him some manjū (sweet bean cakes). He tells him that he should take the manjū to the dwarves in the forest to exchange for their quern (stone mill/ 臼 /usu). Led by a dwarf waving a hinomaru flag enthusiastically, the dwarves are hard at work in the forest building a house. However, they run into troubles dragging the heavy wood uphill. The younger brother laughs are their dilemma and offers to help them. They offer him a meal in thanks but the younger brother shows them his manjū. The dwarves begin salivating at the sight of the sweet manjū and beg him to share them. They even offer him money for the manjū and he refuses, asking instead for their quern. After some discussion, they agree to this deal and they explain the secret of how to use the magic quern. When he turns it right and makes a wish, what he wishes for appears. To reverse the magic he must turn it to the left. 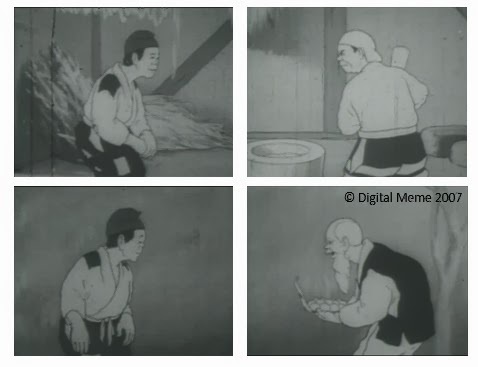 The younger brother wishes himself a house, a warehouse, and rice fields, and before long his wealth exceeds all the others in his village including his older brother. The older brother is overwhelmed by jealousy and asks his younger brother if he can borrow the quern. The younger brother says it would be useless to the older brother because he is already a wealthy man. So the older brother steals the quern and leaves the village by sea. As he double-checks that he has brought everything he needs, the older brother notices that he forgot to bring salt with him. He then uses the quern for the first time and wishes for salt. Unfortunately, he doesn’t know how to tell the quern to stop and the growing pile of salt causes the boat to sink. The older brother is eaten by a shark and the quern falls to the bottom of the sea where it continues to dispense salt into the ocean for eternity. Chūzō Aoji (青地忠三, 1885-1970) wrote the screenplay for Why is the Sea Water Salty? Aoji worked with Murata (村田安司, 1896-1966) at Yokohama Cinema Shokai where they collaborated on many animated shorts in the 20s and 30s such as Taro’s Toy Train (太郎さんの汽車, 1929) and Momotaro of the Sea (海の桃太郎, 1932). Although versions of this folktale have been recorded in many counties (see: D.L. Ashliman’s Folktexts for some examples), the origins of the tale adapted by Aoji and Murata appears to have roots in both Norway and Japan. The Norwegian folktale “The Mill That Grinds at the Bottom of the Sea” (Kvernen som maler på havsens bunn) is one of the most well-known salt folktales. It was first published by 19th century folklorists Peter Christen Asbjørnsen and Jørgen Engebretsen Moe in Norwegian Folktales (Norske Folkeeventyr) which appeared in various formats starting with a slim pamphlet in 1852. The tale was translated into English by Sir George Webbe Dasent and can be found in his 1888 publication Popular Tales from the Norse (Project Gutenberg) under the title: “Why the Sea is Salt” (sic). It is believed that this tale likely found its way to Japan in the late Meiji or early Taishō period, sometime after its publication in English. There has also been some evidence that in Taishō 12 (1923), a similar story to the Norwegian one was brought to Japan by people who arrived by boat from Russia (Source). The Norwegian tale is set on Christmas Eve, but the Japanese version changes this to Oshōgatsu (Japanese New Year), as this was (and remains) the most important holiday in Japan. Stylistically, Murata has gone with cut-out animation. 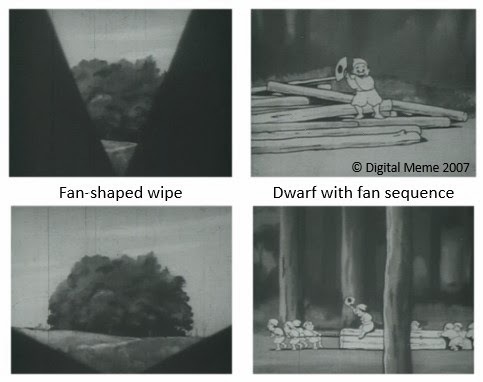 This was common practice in pre-war Japanese anime because it saved money for both in materials (celluloid was expensive) and labour (moving cut-outs is faster than drawing successive images). The cut-out technique used is fairly straight-forward. The animator has used as few set-ups as possible, with mostly establishing shots and medium-long shots being used. Interestingly, Murata chooses to shoot dialogues in two separate spaces linked by a pan rather than having the characters occupy the same frame. I don’t really see any aesthetic benefit from this so can only presume that this was done in order to simplify the animation process. In the sequence that narrates about the wealth the younger brother acquired with the magic quern, I had the impression that the quern might have been done using stop motion of a real quern. The other interesting stylistic note is the edit that introduces the dwarf forest. It is a fan-shaped wipe opening from the top the screen – and matches to the use of a fan by one of the dwarves in the scene that follows. On the whole, the film itself is a straight-forward retelling of a story that has a complicated oral history. In terms of originality, for me the best scenes are the one where the dwarves are trying to get the wood up the hill, and the final scene when the sea creatures are startled by the arrival of the quern at the sea bottom.